C-3PO was worried: "We're doomed." The main reactor was shut down and they were concerned about their coming doom. Rebel soldiers took their positions at the end of the corridor, preparing to defend the door from an assault of boarding white-armored stormtroopers, the Emperor's elite soldiers. The Rebel craft was sucked into the underbelly of the larger spacecraft as the door was blasted off - and the Rebel soldiers fled after a valiant defense. With the corridor secured, the dark menacing shape of black-garbed, helmeted and faceless Dark Lord of the Sith, Darth Vader (David Prowse, voice of James Earl Jones) entered the battle scene. In a smoke-filled hallway, white-robed, slim-figured Princess Leia Organa (Carrie Fisher) adjusted something on R2-D2's computer faceplate, then disappeared. Soon, the Rebel ship was captured and commandeered by Darth Vader, who was on the bridge of the ship interrogating a Rebel officer: "Where are those transmissions you intercepted? What have you done with those plans?" Vader's iron grip crushed the man's throat, and he ordered the ship torn apart to locate the plans. 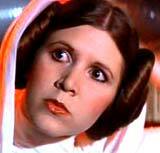 During a search for prisoners, Princess Leia refused to surrender, but was taken captive prisoner. Meanwhile, in another part of the ship, R2-D2 entered (with a reluctant C-3PO) a cramped life-pod while bleeping about a "secret mission" and "plans" - and the tiny escape pod was jettisoned away from the Rebel ship. Princess Leia was brought to Vader, who again demanded the transmissions beamed onto the ship by Rebel spies, but she refused to cooperate, claiming she was a member of the Imperial Senate on a diplomatic mission to Alderaan. Vader ordered one of his troops to generate a fake distress signal from the Rebel ship, and then broadcast to the Senate that all the Rebels aboard were killed. He then sent a detachment to retrieve the escaped pod (without life-forms onboard) and recover the plans: "There'll be no one to stop us this time!" The escape pod crash-landed on the planet Tatooine - a backwater, desolate, arid, desert-like planet with rolling sand dunes, but the droids weren't injured. The two split up, with R2-D2 heading for rocky mountains in the distance, while C-3PO went in the opposite direction. A transport appeared on the horizon and C-3PO hailed it. Meanwhile, R2-D2 entered a rocky canyon area where from the shadows, pairs of yellow eyes, short alien creatures garbed in brown cloaks with hoods peered out. Two of the Jawas, scrap-junk collectors of the planet, ambushed R2-D2 with a magnetic blast, and the droid toppled forward. R2-D2 was carried to an awaiting massive sandcrawler, and placed in its interior holding area, where R2 was reunited with C-3PO within the large junkpile. Back at the pod crash-site, stormtroopers were also on their trail. The sandcrawler stopped to sell its wares at the Lars homestead in the desert, where Owen (Phil Brown) lived with his wife Beru Lars (Shelagh Fraser) as a moisture farmer, aided by their nephew Luke Skywalker (Mark Hamill). Both C-3PO and R2-D2 were purchased by Owen, and Luke was given the task of cleaning them up in his uncle's garage. Luke expressed his dreams of escaping from "this rock" and traveling to distant lands. While cleaning the droids, Luke accidentally tripped one of R2's switches, which projected a 3-D hologram into the middle of the room. It was a miniature image of the Princess, pleading repetitively for help from wise, noble Jedi warrior/mentor Ben "Obi-Wan" Kenobi: "Help me, Obi-Wan Kenobi. 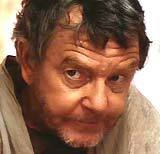 You're my only hope..." Luke knew of a Ben Kenobi, "a strange old hermit" who lived out beyond the Dune Sea. At dinner, when Luke told his Aunt and Uncle about the connection to old Ben, his Uncle turned silent, but then said Ben was only "a crazy old man" who didn't exist anymore - "He died about the same time as your father." Luke was curious, but was told "to forget it." He then changed the subject and proposed applying to the Academy, instead of staying on for another harvest season, but his uncle insisted on Luke remaining for another year. The young nephew retreated outside, where he watched Tatooine's twin suns on the horizon, and dreamed of far-off adventures. Back in the garage, C-3PO told Luke that R2-D2 had wandered off into the darkness "babbling on about his mission." The next morning, Luke and C-3PO pursued the renegade droid in the family's floating land-speeder. They were watched from a high ridge in the Jundland Wastes by a Tusken Raider (dreaded warriors known as Sand People) as they came upon R2-D2 and put an end to his escape. Luke was suddenly attacked by one of the Sand People, while R2-D2 hid in a crevice. When the alien creatures were starting to ransack the land-speeder, a howl was heard from an approaching mysterious stranger -- a figure in a brown, hooded robe - who scared the Sand People away. The stranger pulled back his hood, revealing a beard and blue eyes -- it was Ben Kenobi (Alec Guinness) -- who said he hadn't been called "Obi-Wan" since before Luke was born. The group traveled in the land-speeder to Ben's desert home, where he revealed he had fought in the Clone Wars: "I was once a Jedi Knight. The same as your father." (Luke had thought his father was simply a navigator on a spice freighter, but he was according to Ben "the best starpilot in the galaxy, and a cunning warrior.") Ben gave Luke something his father wanted passed down to him, a small sword-handle: his father's elegant weapon -- a light-saber ("the weapon of a Jedi Knight"). Jedi Knights were guardians of peace and justice in the old Republic before the dark times, before the Empire. Luke also learned how his father died: "A young Jedi named Darth Vader, who was a pupil of mine until he turned to evil, helped the Empire hunt down and destroy the Jedi Knights. He betrayed and murdered your father. Now the Jedi are all but extinct. Vader was seduced by the dark side of the Force...The Force is what gives a Jedi his power. It's an energy field created by all living things. It surrounds us and penetrates us. It binds the galaxy together." "General Kenobi. Years ago, you served my father in the Clone Wars. Now he begs you to help him in his struggle against the Empire. I regret that I am unable to present my father's request to you in person. But my ship has fallen under attack and I'm afraid my mission to bring you to Alderaan has failed. I have placed information vital to the survival of the rebellion into the memory systems of this R2 unit. My father will know how to retrieve it. You must see this droid safely delivered to him on Alderaan. This is our most desperate hour. Help me Obi-Wan Kenobi. You're my only hope." Kenobi then persuaded reluctant Luke to join him part-way to Alderaan (to the local spaceport at Anchorhead, where he could get a transport to Mos Eisley), but first emphasized he must "learn the ways of the Force." On board the Empire's Death Star, a gigantic Imperial space fortress, officers in a large conference room argued about the power of the rebels to threaten them (especially since the Rebels possessed a "complete technical read-out" of the station), as commander Grand Moff Tarkin (Peter Cushing), a skeletal, vicious-looking, power-mad tyrant, and Darth Vader entered the room. One of the officers, General Motti (Richard LeParmentier) was unperturbed and boasted: "This station is now the ultimate power in the universe." But Vader cautioned about the Death Star's potential "technological terror" -- "The ability to destroy a planet is insignificant next to the power of the Force." Tarkin predicted the crushing of the Rebellion "with one swift stroke." During their journey back through the Tatooine wasteland, the group came upon the wrecked remains of a Jawa sandcrawler. Although the Sand People were suspected, Kenobi believed that Imperial stormtroopers were actually responsible. Luke was distressed that the Imperials may have traced the robots back to his Aunt and Uncle's place. There, he found only smoke, ashes, and the charred skeletons of his relatives. In the dungeon of the Death Star, Princess Leia was imprisoned in a cell. She was confronted by Darth Vader, who threatened with a round, mechanized, mind-probe torture device, to learn the location of the hidden Rebel base. Soon after, when the Princess resisted the torture, Tarkin ordered their course set for Alderaan. Meanwhile, Luke returned to the sandcrawler, where he told Ben that he would accompany him to Alderaan: "I want to learn the ways of the Force and become a Jedi like my father." They traveled in the landspeeder to the Mos Eisley spaceport (a "wretched hive of scum and villainy"), guarded on the outskirts by stormtroopers, who were Force-influenced by Kenobi to let them pass. In town, Ben and Luke entered a cantina to find a freighter-pilot to take them to Alderaan. Inside, they encountered a vast array of alien creatures, and an alien band. 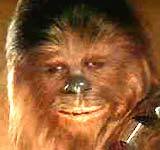 After dispatching one of the villainous aliens with his lightsaber to defend Luke, Ben spoke to a tall, enormous 7 foot tall furry anthropoid creature, Chewbacca the Wookiee (Peter Mayhew), the first mate/co-pilot on the freighter The Millennium Falcon captained by Corellian smuggler Han Solo (Harrison Ford). 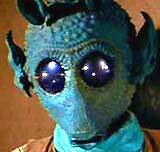 Solo demanded ten thousand for passage to Alderaan, leaving from Docking Bay 94, and was offered seventeen thousand. As they prepared to leave, Han was stopped by a green-skinned bounty hunter named Greedo (Paul Blake), employed by crime lord Jabba the Hutt. He shot the alien thug under the table with his concealed weapon, and then fled to his ship, where the fat, slug-like Jabba with a gang of pirates, including another bounty hunter named Boba Fett (Mark Austin), demanded a long-overdue payment (with 15% interest). Han promised payment but asked for a little more time to earn the money from the chartered trip to pay his debt. Although followed, Ben and Luke and the droids proceeded to the docking bay, where they saw Solo's battered, modified Millennium Falcon (Luke: "What a piece of junk!"). A gun-fight broke out between stormtroopers and Han, who held them off while Chewbacca prepared to launch, and they successfully blasted the vessel into the sky. It was necessary for Han to jump to the safety of light-speed to avoid Imperial cruisers (Star Destroyers) in pursuit. Moving into the Alderaan system with the Death Star, the ruthless Grand Moff Tarkin planned to test the power of the Death Star by destroying Leia's home of Alderaan, a small bluish-green planet in space. In the control room, he explained his revenge to the Princess, because she refused to reveal the locations of other space rebel bases. In her horrified and pained view, the blue planet Alderaan was blown to pieces by a powerful superlaser. The Rebel base at Dantooine was the next target to be destroyed. On the Millennium Falcon, mystically connected with the Force, Ben's body weakened at the moment of Alderaan's destruction. Nearby, Luke practiced with the light-saber against a hovering remote, and Ben advised him as a mentor, reminding him during his exercises to rely on the instinctual responsiveness of the Force rather than on his conscious self: "Remember, a Jedi can feel the Force flowing through him." 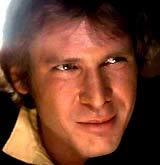 But Han laughed and was skeptical about "hokey religions and ancient weapons" - he scoffed at the idea of the Force. Kenobi placed a helmet with a blast shield over Luke's eyes and urged: "Stretch out with your feelings," and soon Luke was successful in deflecting the remote's shots. Soon, they approached Alderaan. 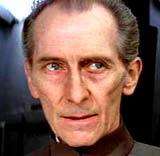 On the Death Star, Governor Tarkin - feeling betrayed - ordered the termination of the deceitful Princess Leia. Coming out of hyperspace when nearing Alderaan, the Millennium Falcon emerged into a storm of meteorite rocks and asteroid debris - the remains of the blown-away planet. They were amazed to see a short-range Imperial fighter returning to the immense, planetoid-like space station base. Although Han attempted to turn them around with auxiliary power, they were drawn, pulled, and helplessly sucked into the huge Death Star by its tractor beam. To evade capture by the Empire when the Falcon was boarded (and identified as the ship that left Mos Eisley, to possibly return the stolen plans to the Princess), Han placed everyone in secret compartments under the floor used for smuggling. Ben had a plan -- to ambush and overpower some of the guards and wear their uniforms. Then, they took charge of the command station control room, where R2-D2 accessed the Imperial network through a computer terminal, to locate the schematics of the main controls to the power beam that held their ship. Kenobi decided to create a power loss at one of the terminals to allow the ship to leave, and refused Luke's request to join him, stressing: "The Force will be with you...always." R2-D2 also located the Princess in the detention block (where she was scheduled to be terminated), and they pretended to be leading Chewie as their "captive" through the halls of the Death Star. They blasted the jailers and officers at the entrance to the detention block, and rescued the Princess from her cell. Vader and Tarkin were informed of the security breach at the cell block, and Vader again mentioned a sensation of detecting Obi-Wan in his presence: "A tremor in the Force...I must face him. Alone." To escape from the cut-off cell bay in the prison, the group blasted a hole in a small ventilation shaft and jumped into a garbage chute that led to a garbage crushing chamber filled with slimy water, garbage, and a tentacled, single-eyed, snake-like trash monster. Luke used a communications link to ask R2-D2 to shut down the garbage mashers on the detention level, and they were safely released through open garbage-maintenance hatches. The group then made their way through the Death Star. At the same time, Kenobi reached a tractor beam control on a column located over a deep trench and was able to deactivate the beam that held their ship. The others could see their ship but were unable to reach it when confronted by another group of stormtroopers. When they split up, Luke and the Princess were trapped at a dead end, and Luke almost fell off the dead-end ledge of the floor down into a deep shaft. He used a grappling hook and cable and swung across the large chasm, with the Princess holding onto his waist. In another corridor next to the hangar holding the Millennium Falcon, Kenobi came upon the dark figure of Darth Vader, who acknowledged Ben as his former master. The two fought a confrontational duel to the death with laser light-sabers. Obi-Wan cautioned: "You can't win, Darth. If you strike me down, I shall become more powerful than you can possibly imagine..." From a distance, Luke could see their combat and called out: "Ben?" When Kenobi looked and saw Luke, he smiled, lowered his guard, as Vader cut him in half. His robe fell to the floor, but he had vanished inside. Ben had successfully diverted attention from the rest of the Falcon group and everyone (except Luke) reached the safety of the ship. Ben's death also released the Force from his body and it traveled to his companions. Moments later, Luke heard Ben's voice, telling him to leave the fight and join his comrades on the ship: "Run Luke, run." Solo piloted the Falcon, released from the tractor beam, and it sailed into space. Both Han and Luke, manning the turret guns, had to evade pursuing TIE fighters in a dogfight before they were able to enter hyperspace. However, they didn't know that Vader and Tarkin had placed a homing device in the vessel to track them. Princess Leia hoped that R2's technical readouts of the Death Star battle station would provide them with key information about its flaws. They landed at the secret Rebel base on the far side of the 4th moon of a small planet named Yavin. [The Death Star was also approaching after them.] An ancient temple, the base was concealed under thick jungle foliage. After they landed inside the Rebel base, the Alliance leaders in the Rebel War Room extracted and studied the Death Star technical readouts and blueprint data from R2-D2's computer data banks - locating a "weakness" to help plan their attack. Commander General Dodonna (Alex McCrindle) postulated that a small, one-man Rebel fighter should be able to penetrate the giant battle station -- to maneuver straight down a trench to a small target, a thermal exhaust port, which led directly to the main reactor system. A precise hit with a proton torpedo should cause a chain reaction to destroy the station. He told his pilots: "Man your ships, and may the Force be with you." Rewarded, Han prepared to leave the base after considering the mission suicidal, although he did wish Luke luck: "May the Force be with you." Luke slipped into his X-wing fighter's cockpit as part of the Red Group squadron, to be aided by a Gold Group squadron piloting Y-wing fighters. As he prepared to take off, Luke heard Ben's spirit speaking to him: "Luke, the Force will be with you." The Death Star was only 15 minutes away from firing range. The thirty fighters were small evasive targets, although they were pummeled by turbo-laser-fire from the station's defensive towers. Then, they realized that the Death Star had sent enemy fighters against them - TIE fighters to engage in dogfights with the Rebel ships. Most of the Rebel fighters were shot out of the sky by Imperial fighters, but Vader was concerned about a few of the most daring fighters who appeared to be attacking into the trench - he personally joined the fight in his own fighter ship. The Y-wing fighters of the Gold Group entered runs down the trench toward their exhaust port target, but they were targeted from behind by Vader and his TIE fighters - and most of the Rebel attackers were destroyed. More of the Rebel fighters of the Red Group (Luke's group) entered the Dogfight Alley trench, but they too were eliminated by deadly fire from Vader's fighters. Soon with only one minute left before the Death Star was in range, Luke was the last hope of the Rebels as he sped down the narrow corridor (with his targeting computer switched off), relying on words he heard spoken by Ben: "Use the Force, Luke." At that moment in his battered freighter, roguish Han Solo and Chewbacca unexpectedly reappeared ("Yahoo!") to defend Luke just as Darth Vader was preparing to destroy his Rebel fighter. Vader's fighter ship went spinning wildly off into space, as Luke fired at the target and his two proton torpedoes found their mark. As the Death Star prepared its firing sequence to destroy Yavin, the station itself exploded. Luke heard Ben's reassuring words: "Remember, the Force will be with you always." Luke in his Red Five and Han and Chewie in their Falcon, among the few remaining Rebel fighters to survive, returned to the safety of the Rebel base. R2-D2 was repaired, and Han was commended for his unselfishness (The Princess: "I knew it was more to you than money"). In a triumphant celebratory ceremony, they were hailed as heroes by Princess Leia and other Rebel Alliance members. Each of them was decorated and honored with golden medallions for their bravery. 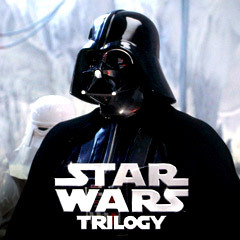 The first film of the series (in the original saga), and the fourth film in terms of chronology. Nominated for ten Academy Awards (with six wins): Best Art Direction (win), Best Costume Design (win), Best Film Editing (win), Best Score (win), Best Sound (win), Best Visual Effects (win), Best Director, Best Picture, Best Original Screenplay, and Best Supporting Actor (Guinness). Winner of a Special Achievement Award. This was the only "Star Wars" movie to be nominated for the Best Picture Academy Award. With a production budget of $11 million, it grossed $1.5 million in its limited opening weekend. It grossed $307.3 (domestic), $461 million (lifetime domestic gross), and $775.4 million (worldwide). Star Wars (1977) was the first film to earn more than $400 million (domestically). It reached this mark in February 1997 after the re-release or re-issue of its 20th anniversary edition. Star Wars: Special Edition (1997) earned almost $36 million in its opening weekend, and soon topped E.T. : The Extra-Terrestrial (1982) as the all-time domestic box-office champ. 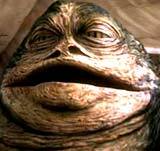 The 1997 "Special Edition" release featured far more advanced CGI characters and effects, including an enhanced Death Star explosion, an added scene of a CGI Jabba the Hutt confronting Han Solo, and an improved look to the city of Mos Eisley including the infamous "Greedo fires first" edit. Set-pieces: the arrival at Mos Eisley and the cantina scene, the Millennium Falcon's turret scene, in which Luke and Han gunned down attacking TIE fighters ("Great kid. Don't get cocky! "), and the Death Star trench scene with the spirit of Ben urging Luke to "let go" and trust the Force.